Johnson Family Dental provides free dental care to the community of Santa Barbara, CA. Dr. Steven Johnson is out to change lives by offering free smiles to anyone who needs dental work, as he hosts the 16th free Dental Day at their Santa Barbara office on Saturday, May 4th from 8am-1pm. Over 200 members of the community are expected to turn out for the event that is held at the Johnson Family Dental office at 3906 State Street in Santa Barbara. 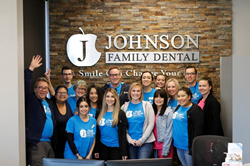 Members who can’t be seen at the free dental day event on May 4th have the opportunity to attend Johnson Family Dental’s alternate free dental day at our office located at 678 Alamo Pintado Rd in Solvang. The Solvang office will be having their free Dental Day in conjunction with their Grand Re-Opening, Saturday May 11th from 8am-1pm.